With the Lattissima Pro, you can have the perfect coffee, made to your exacting standards, at the touch of just one button. 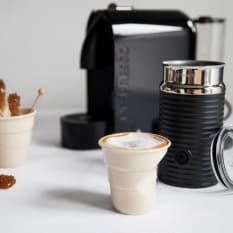 The Lattissima Pro has 7 programmable buttons, for everything from straight up espresso to a froth latte, and even frothed milk or hot water. Even better, the Pro features the improved Latte Crema System, which dispenses hot, cold, frothed or creamed milk directly into your cup. It even has an auto clean programme, to keep things tidy. Nespresso coffee capsules contain freshly roasted and ground Grand Cru coffee, sealed into airtight capsules. This ensures no ageing occurs, so it’s as perfect and fresh as the day it was roasted. 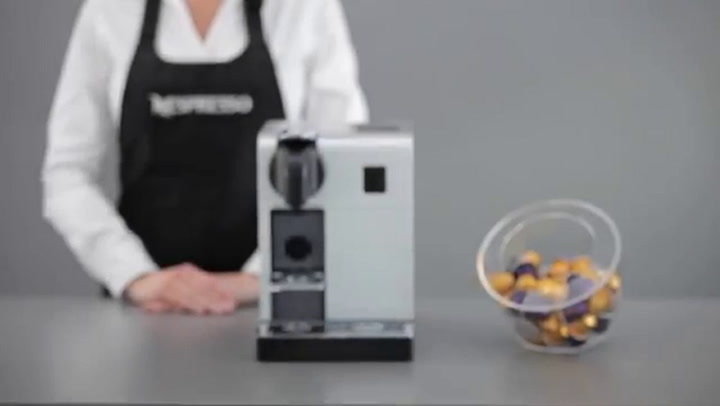 Included in each Nespresso machine’s box is a selection of 14 capsules. NOTE: Nespresso machines are only compatible with Nespresso coffee capsules. There are 24 standard varieties available, as well as other varieties and flavoured coffees available seasonally. These capsules must be purchased from Nespresso boutique stores or on their online store. Any promotional capsule vouchers included with purchase are redeemable at Nespresso stores only. Receive a free set of 14 Nespresso capsules with every Nespresso machine purchased. View more from Gifts for The Home Barista, Capsule Espresso Machines, Nespresso Machines with Milk Frother. I'm one of those people who love a good cup of coffee. But I always end up having the rubbish stuff because I just don't have the time to filter just enough coffee for that single cup at home in the mornings, let alone anything nicer. I decided it was time to go for a pod based system, and this had the best feature set of any of the Nespresso machines. It was more expensive than the others by quite a bit, but you won't feel a hint of buyer's remorse. The coffee is brewed flawlessly and the milk frothed perfectly. Cleaning it after is effortless and you can store the milk container in the fridge so you aren't wasting anything. The Lattissima Pro ticks all our boxes!! We upgraded from a smaller Nespresso machine (many years of good service) to this one, and haven't looked back a day. Easy to use and we just love the variety of coffees that can be made. Cleaning of parts very quick. I am so happy with my Nespresso Lattissima Pro Automatic Espresso Machine. What a pleasure to use it. My friends are very impressed too. This is not my first machine, but definitely the best - I really enjoy this nifty gadget! Awesome coffee, cappuccino and latte at the touch of a button, simple to use and to clean, simply the best Nespresso machine available.